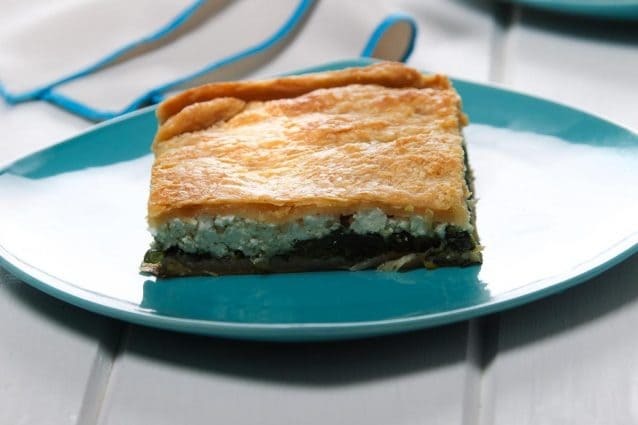 Today we prepare a delicious Spanakopita recipe: the spinach and Greek feta cake. A Mediterranean recipe, vegetarian, comforting and that the whole family can enjoy. And it improves even more as a filling of a cake with golden and crisp crust. It is a very easy recipe to prepare and with few ingredients. Chop finely the onion and sauté it in the butter about 10 minutes. Let cool. Blanch the spinach in boiling water with salt. Rinse and drain well. With your hands, crush them gently to remove all excess liquid. Chop a little with a knife or scissors. 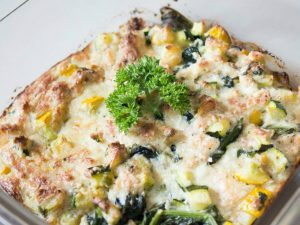 Mix spinach, onion with butter, slightly beaten eggs, milk and parsley in a bowl. Crumble the feta cheese over and mix. Add a little salt and pepper. Mix spinach, onion with butter, slightly beaten eggs, milk and parsley in a bowl. Crumble the feta cheese over and mix. Add a little salt and pepper. Sprinkle with oil a baking pan, preferably round. Spread about five slices of pasta on the mold, painting each with a little oil (Note: be careful, the pasta cannot be kept in the air for a long time, open the package just when it will be used). 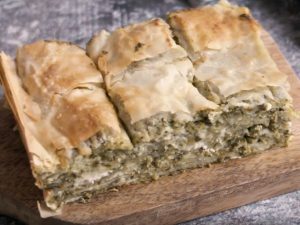 Incorporate the spinach mixture. Put other sheets of paste on top, also painted with oil. Roll the dough that protrudes from the mold. Mark the cake by servings carefully to cut only the top layer of filo paste. Sprinkle with a little water and bake for 1 hour, until golden and crisp. Serve warm or at room temperature.